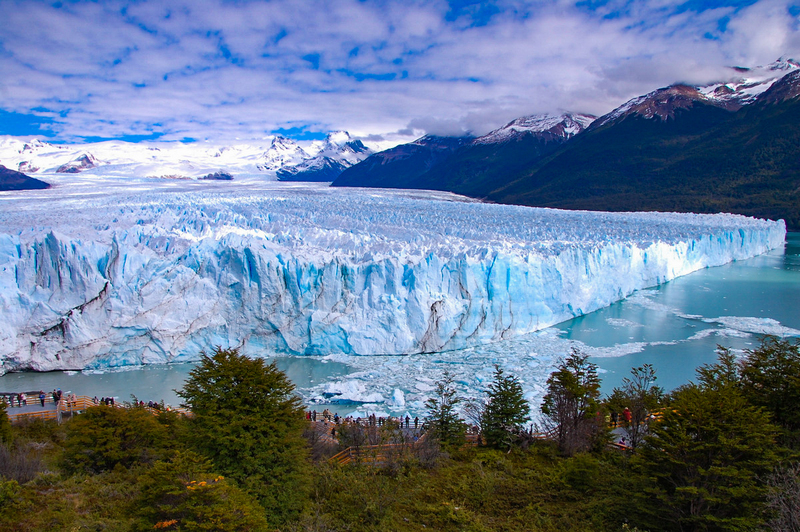 The name Perito Moreno derives from the explorer Francisco Pascasio Moreno who discovered it. His profession was Perito (expert, specialist in his domain). At first I thought that the name of the glacier was after a Little Brown Dog (in Spanish). However ”little dog” is written with 2 Rs (Perrito). It is situated 70 km from the town of Calafate. From there you can take a bus, organized tour or simply ask your hotel to arrange you a taxi at a flat fare. We opted for the last one. Our taxi driver was amazing. (I still have her contact details if you are interested). By plane from Buenos Aires: BE CAREFUL as the last flight from El Calafate to Buenos Aires arrives to a different airport from where it departed. Almost everyone on the plane was surprised when few minutes before landing we heard that we will land at Aeroparque Jorge Newbery instead of Ministro Pistarini International Airport (known as Ezeiza) from where we took off. Some passengers had their connecting flight there and the distance between the 2 airports is 42 km. The airport organizes transfer. But since it was taking too long to get everything organized we went to pick up a taxi. The queue there was really long. As a result we went to the departures terminal to catch a taxi there. However not everyone wanted to take us but we were lucky and one driver stopped and took us to our hotel at the Ezeiza airport. (The hotel was located 10 minutes’ drive from the terminal itself). By bus from Buenos Aires to Puerto Gallegos (36 hours journey) and from there another bus to El Calafate (4 hours). From Chile (if you are already there visiting Torres del Paine) – around 3 hours and a half drive. Foothbridges: A part of the park is adapted for wheelchairs. In adittion there is a lift so you could take the stroller. However, the footbridges have a lot of stairs to the best viewpoints so it is better to carry the toddler in a baby carrier. We left the stroller in the taxi. The views are simply amazing. You should not miss the differents view points on different part of the foothbrigdes. The minimum time of visit is 2 hours. We could not stop staring at the glacial and could not stop listening to the amazing sounds of the ice cracking and breaking. You can also have a walk on the glacial. There are organized treks of a different length. By boat: You can get very close to the glacial. We took the stroller with us and left it in a safe place and not disturbing anyone. Besides, everyone was outside admiring and taking pictures of the Glacial. We were also lucky that it was the nap time of the toddler, so in turns, we were going out to admire the amazing Perito Moreno. Once you are in El Calafate a visit to El Chalten is a must.